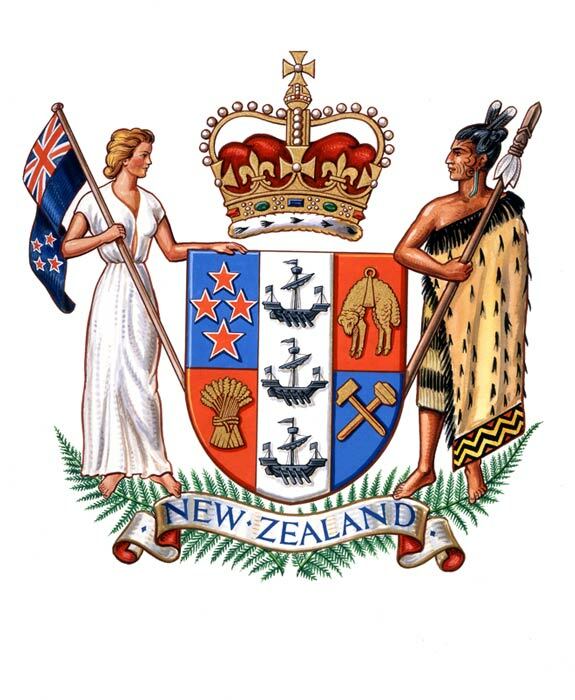 The first New Zealand Coat of Arms (officially the Armorial Bearings of the Dominion of New Zealand), which was warranted on 26 August 1911. Note that ‘dexter’ and ‘sinister’ are Latin for ‘right’ and ‘left’ respectively. From 1840 until 1911 New Zealand used the British Royal Arms. The first known move to establish a Coat of Arms for New Zealand was a design competition in 1906. Legend has it that the submissions were destroyed by a fire in the old Parliament Buildings the following year. In fact they are still held in Archives New Zealand. Whatever the reason, the competition was rerun in 1908, when 75 designs featuring everything from kiwis, sheep, cows, moa and lions to stars, ships, British soldiers, Māori warriors and Union Jacks were received. Three entries were sent to England for the final judging. The winner was James McDonald, a draughtsman in the Department of Tourist and Health Resorts. A Royal Warrant granting armorial ensigns and supports was issued on 26 August 1911 and published in the New Zealand Gazette on 11 January 1912.
replacing ‘onward’ with ‘New Zealand’.